All living beings undergo some form of evolution from time to time. The element of natural selection keeps organisms on their heels so to speak. However, as the most dominant species on the planet we might not be at an advantage in seeing evolution in other organisms, especially pathogens. Case in point is antigenic shift in the influenza A virus. An antigenic shift is usually brought about by the exchange of genetic material between two different viral strains. 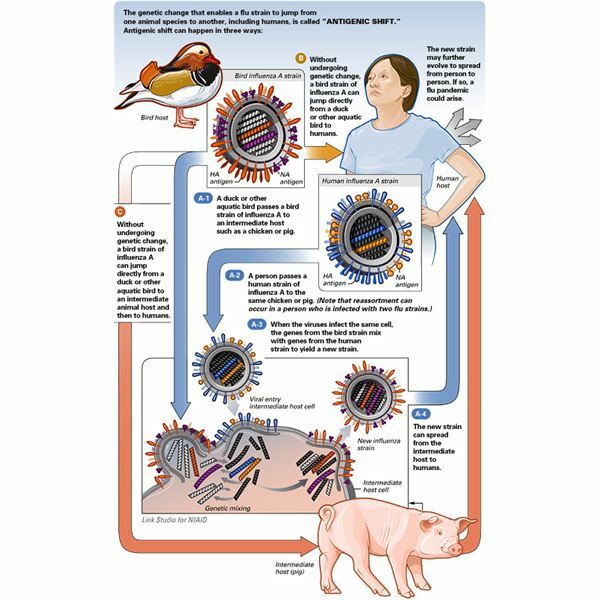 Consider a strain of influenza that can infect only birds and another that can infect humans (influenza A); an exchange of genetic material between these two strains could result in a new strain capable of infecting both birds and humans. This phenomenon is described as antigenic shift. It is defined as a change in a pathogen (usually influenza A) which results in the modification of the antigenic epitope or feature, which may also influence host selection. Antigenic shift has been significantly observed in influenza but need not in any way be restricted to it. So why is antigenic shift so important? Well apart from the research value it provides as a model of evolution – it becomes a grave danger when epidemic outbreaks occur in human beings. When a pathogen can survive in its selective host and yet another additional host, it becomes difficult to eradicate. Image credit: National Institute of Allergy and Infectious Diseases (NIAID). Our immune system is a potent one that tries to ward off any attacks by pathogens. The main strategy used by the immune system is “memory" – once attacked by a pathogen, the immune system develops antibodies against that specific pathogen to prevent recurrence. Thus the immune system is able to identify the pathogen if it invades again. However, an antigenic shift involving a change in the pathogen’s protein structure makes this memory based identification useless. Thus antigenic shift makes virus removal from our body by the immune system difficult. The immune system makes antibodies that recognise the protein coats of the viruses. However, an antigenic shift causes changes in protein coats and therefore renders the antibodies useless! Awareness and further study of the phenomenon of antigenic shift could help us protect mankind from possible viral strains that we have no knowledge of today, but may very well face tomorrow.